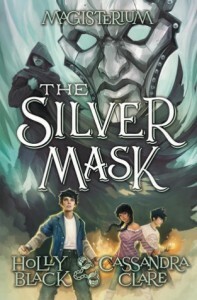 This latest entry in wonderful MG magic-school series Magisterium balances some seriously dark themes and action with laugh-out-loud lines. 'd say this is borderline YA - as the kids move on through the school years/grades, they're heading into teen territory, adding kissing and mild romance angst to death, identity crises, and necromancy. I'd recommend for older kids, maybe 10 or even 12+. But the relatively simple language and style of expression are solidly middle grade. Looking forward to the big wrap up in book 5!